Scorpions are infamously known to be more than just a nuisance to humans. Not only do they sometimes appear unexpectedly inside your home, they have also been known to pose a serious threat to humans with their life threatening stings. But before you jump on the bandwagon and assume that one of the oldest terrestrial arthropods have absolutely no value, you should think again. According to The University Of Arizona, these interesting desert creatures also play a very important and beneficial component of many ecosystems. They are known to be one of the oldest known terrestrial arthropods. The university report that the Fossils that are found in Paleozoic strata 430 million years ago, appear to be quite similar to the present day species. An estimated 40-60 species can be found here in Arizona, although, according to the University Of Arizona, many are under-scribed. 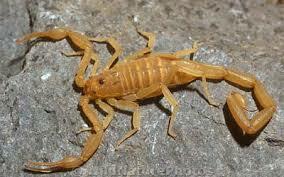 The Bark Scorpion (known as the Centruroides Exilicauda) is the only species in Arizona of medical importance. Here in the United States, the Bark species is found in Arizona, southeastern California, Nevada, southern Utah, and also southwestern New Mexico. They can also be spotted in the Baja Peninsula and in western Sonora, Mexico. The common "Bark," also known as the "Crevice" scorpion, is approximately 1-3 inches in length and is most commonly found in my house! (See picture above.) Truthfully, even though I have a monthly pest control service provider, these little guys are usually first spotted by my cat several times throughout the year. Other than homes, they are commonly found underneath dead trees, rocks or any other item that is cooler than in the direct Arizona sun. If you are trying to find one of these little creatures, you will very likely be able to find them in any rocky habitat. This creature is known for its solitary existence in nature, with exception of the Bark species. This species is known to be found in numbers ranging anywhere from 20-30 in number. Unlike other species the Bark species is also one of the few species that make climbing a part of its characteristics. Other species found here in Arizona are the Desert Hairy and the Striped-Tailed. The Desert Hairy species (Hadrurus Arizonens) is twice as large as the Bark species, when fully matured. Found in the lower sandy habitats throughout the state of Arizona, the Desert Hairy can reach up to 5 inches in length. The Desert Hairy usually eats insects, spiders, centipedes, small vertebrates and even its own species, too. The Stripe-Tailed species, (Vaejovi spp.) includes several Vaejovid species found in Arizona. They are 1-2 inches in length and considered more "hearty" than the Bark species. The Stripe-Tailed is typically found under many surface objects such as sleeping bags! Yes, sleeping bags. So check your bags before sliding into them! They can also be found in shoes or anything that they can easily crawl into. It pretty much goes without saying that these guys are known for their "burrowing!" They also like to burrow in the gravel, too. It's not as if they are specifically looking for your shoes or even your sleeping bag. These creatures are classified as venomous arthropods in the class Arachnida. Some interesting facts about them in which I discovered was that they are actually relatives of another "creepy crawler," commonly known as spiders. They are also related to ticks, solpugids, pseudo-scorpions, and mites. Also according to The University Of Arizona, there are currently some 1400 recognized species worldwide. Kids will especially like the fact that they actually glow in the dark! That's right! They glow in the dark because of the presence of the complex sugars and the waxes that act as a form of waterproofing compounds within their exoskeleton. So, if you place a black light up against the body of one, they will light up the night! So, if you think if you just avoid taking a trip to Arizona you can avoid ever coming in contact with one, guess again! Sorry to inform you that they are also found in northern Africa, India, the Middle East, South America and Mexico, where there are 25 species. They have also been discovered at elevations of over 12,000 feet in the Himalayas of Asia and, if you can believe it, when discovered, they were under rocks where snow is quite typical. However, scorpions are found more often in the arid and semi-arid regions. These desert creatures have a very distinctive look to them and the first time that you see one, you will likely always remember the elongated body that characterizes them. They also have segmented tails and it is at the end of these tails where the venomous stinger is located. They have four pairs of legs and pedipalps (that act as "feelers") with plier-like pincers on the end. These pincers are used for grasping. The abdomen consists of 12 segments. The last five of these segments form the "metasoma." The Metasoma, is actually what people refer to as the "tail" of the the creature. At the end of the abdomen is the "telson." The telson is that little bulb like shaped area right next to the stinger that holds the venom. venom. The underside is where you can find some very important sensors that this creature uses to sense both the texture of the surface as well as the vibration. These sensors resemble a comb and are larger on the male than the female. The pedipalps (the feelers) consist of fine sensory hairs that sense any air-borne vibrations. The tips of the legs also have sensory organs that help detect vibrations in the ground. Most are known as ambush predators who detect prey when it comes within reach of its presence. Commonly thought only as desert creatures, they are commonly found in many other habitats. They are found in the grasslands and savannahs, rain forests, caves, deciduous forests, pine forests, and intertidal zones. I have met people who are just terrified of scorpions. Are you? Some people may in fact think twice about visiting Arizona just because of these little critters, let alone moving here amongst them! No need to cancel your plans, though. You can relax, because although scorpion stings do occur, it is not something that you hear about every day. You just have to be careful of your surroundings and keep a "look out" for them because they are very common in the desert southwest region as well as here in Arizona. And, if you have a cat that loves to catch scorpions, you can perhaps feel a little safer, at least in your home! My cat is very good at finding them. In fact, maybe too good. She has found them out in the garage as well as inside the house. She likes to bat them around like a mouse. Fortunately, cats are immune from their stings! Scorpions are nocturnal or diurnal, and are considered predatory animals that feed on other insects. They even feed off their own species! Other insects that they are known to feed off of are centipedes, and spiders. As with most arthropods, they are commonly seen at night when temperatures exceed 70 degrees. The larger scorpions sometimes will prey on vertebrates, such as snakes, small lizards, and mice. You may think that that they do not have any enemies, except for my little lioness, of course! They actually have other enemies such as birds, centipedes,lizards, owls tarantulas, shrews, snakes, and also mammals such as bats, and grasshopper mice. The best time to spot them is at night when they typically prey on other insects. They will spend their days in cooler areas such as under wood, rocks, or any other areas where moisture can be found. These desert creature are creatures of habit, meaning they tend to be found in areas separate from other territories. They will stay in the same area at the end of the day and return to the same area each night. They may enter homes and buildings when their territory has been disrupted by construction. I know first hand that this is certainly true. My house was built in 2001 and I remember seeing them not long after moving in. Like other creatures of the desert, they have adapted well for desert living. They have extra layers of what are called "lipids" or "fats," that are located on their external skeleton. This adaptation prevents them from excessive water loss. I have never seen the "scorpion dance," but I would pay top dollar to see this! It has to be quite comical. The male uses his pedipalps to grasp the female's pedipalps, which is known as the "courtship dance." The male places deposits of sperm on the ground during this dance whereas the male guides the female with his pincers holding hers to the sperm. The female then picks up the sperm with her genital opening, located near the front of her abdomen. The gestation period for a scorpion will last from several months to over a year, depending on the species. The young develop as embryos inside the female. After they are born, they crawl on their mother's back. The mother folds her legs during the birthing process which allows the baby Scorpions to crawl onto their mother's back. I was quite surprised to learn that the females will typically give birth to approximately 25-35 young! I was amazed at this number. The babies will remain on their mother's back until their first molting. The babies are white in color and will climb back onto their mother's back following their first molting. Following this first molting, they will climb back onto their mother's back for another 4 to 5 days, after which time the babies will leave for good. Once the baby scorpions leave their mother's side, they will become independent and continue to molt several times until they reach adulthood. Typically five or six molts over two to six years are required for them to reach maturity. The average scorpion probably lives three to five years, but some species have been known to live up to 25 years. A few will even display social behaviors outside of their association with their mother. Some will participate in social aggregations, and colonial burrowing as well as live sometimes in extended family groups that share burrows and food. Are scorpions poisonous? The venom of the Bark scorpion will likely produce severe pain, but it is not likely to swell. Other complications from the sting may include: numbness, frothing at the mouth, breathing difficulties, which can include respiratory paralysis, muscle twitching, and convulsions. Death from a sting is rare, especially nowadays with the Antivenin that is available. Another reassuring note is that The world's most dangerous species live in North Africa, the Middle East, South America, India, and Mexico, and NOT Arizona. Here are some tips that the University Of Arizona recommends that you do if you would like to see less of scorpions! First, you have to remind yourself that this is the desert and scorpions were here long before we ever were. Besides this is their habitat as well as ours. While none of us can completely get rid of these little creatures as much as you maybe would like to or as hard as you may try. You can, however, reduce their numbers by applying a few simple techniques. I can attest to the fact that they are difficult to control with insecticides alone, but here are a few tips to hopefully help you keep their numbers at a minimum level. Remove any unnecessary items such as: stones, trash, logs, boards, stones, bricks and other objects from around the building. Store your garbage containers in a frame that allows them to rest above ground level. If you have grass up against your house, make sure that it is mowed constantly as they like to hide in the long grass. Keep grass closely mowed near the home. Also, try to keep any of your ground cover vegetation to a minimum length. Prune back your	bushes and any tree branches that are overhanging. You want to keep the branches away from your house because Scorpions are notorious for using the branches as a ladder to your roof! Never bring firewood inside the building unless it is placed directly on the fire. Install weather-stripping around loose fitting doors and windows. Caulk around roof eaves, pipes and any other cracks into the building. By managing the scorpion food source, you will manage their population. If you are unfortunate enough to get stung by a scorpion, please note that it is unlikely that you will develop serious complications from the sting. The best thing to do is to monitor yourself or your loved one, and watch for the severe warning signs that medical attention is needed. While swelling and numbness are common as a result of a sting, if these symptoms and others such as frothing at the mouth, difficulty breathing, muscle twitching and signs of a convulsion appear, it is better to be safe than sorry and get immediate medical attention, even if this means calling 9-1-1. If stung by the Bark species, the site at which you were stung will be immediately painful and difficult to even touch where you were stung. In the unlikelihood that someone dies from a scorpion sting, it is the result of heart or respiratory failure some hours after the incident. Fortunately, most stings are no more painful than a honeybee sting. Just remember to monitor yourself or your loved one who was stung, and you will be in good shape. If you have questions about a scorpion sting or other questions related to them or other insects, etc, you can contact the Poison Control and Drug Information Center, toll-free at 1-800-326-0101.